1-DAY Acuvue Oasys for Astigmatism silicon hydrogel toric contact lenses by Johnson & Johnson correct astigmatism. They offer, apart from high comfort, the patented HydraLuxe technology which reduces eyestrain symptoms and prevents the eyes from getting dry. Thanks to the innovative HydraLuxe technology, the Acuvue Oasys 1-Day for Astigmatism contact lenses contain molecules which are very similar to physiological tears. The moisturising component is present directly on the lens material, as opposed to just its surface, which means the moisturising is much more effective. The tear-like molecules support the tear film positively and thus ensure healthy and comfortable wear. The main reason they're considered so comfortble is the ease with which they slide in the eye without problems, and the optimized solution in the contact lens blister which imitates tears and makes the contacts feel comfortable from the moment you put them in. 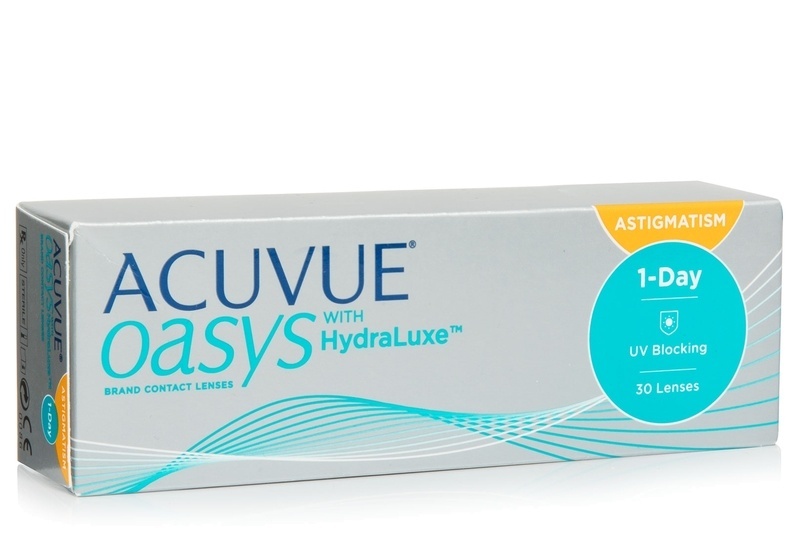 Acuvue Oasys 1-Day for Astigmatism contact lenses have a light blue tint for easier manipulation and a UV filter which blocks 90% of UVA and almost 99% of UVB radiation. Thank you for your question. Please, find the reply in your inbox.